Written by: Allie O'Neal on December 24, 2016. Steampunk has a certain look in costuming and a certain feel in literature, but it can be harder to define in music. 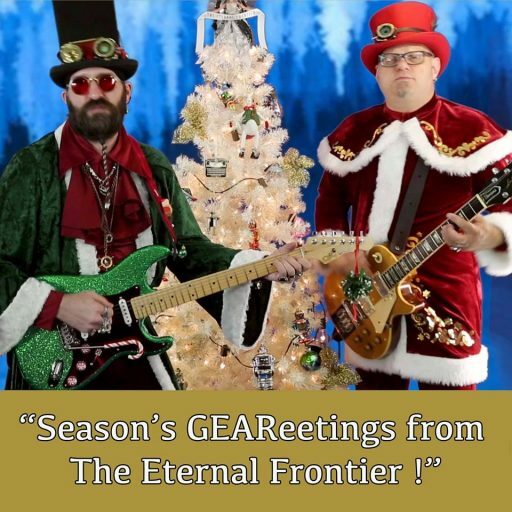 Season’s GEAReetings from The Eternal Frontier (Steampunk Christmas Music) is a four-track mini album that self-identifies as “Steampunk Christmas Music, infused with Pop, Rock, Blues, Country and Folk.” The lyrics, however, are unmistakably Steampunk. The first track, “Santa’s Making Time” (which you can watch below), introduces Professor Adam Smasher and Baron Von Zipple in a cute Steampunk Santa story. The second track, “100 Years of Christmas,” has a Jonathan Colton feel to it, with shades of Chiron Beta Prime. The third is called “Steampunk Yule Ditty,” and is my favorite track with the best steampunk lyrics. The final track is “Snoopy’s Christmas,” for the most part a cover of the song with the familiar refrain about Christmas Bells, but with a heavier beat and a few lyrical changes. GEAR up your Christmas weekend by downloading this album via CD Baby for $5.99. Follow The Eternal Frontier on Facebook.